The Best Michigan Beach Resort Or Hotels. A top Michigan beach resort is all about romance and quality time together. If you're like us, you just know when it's "time to get away" from it all. These fine resorts will offer everything you desire to "kick back" and reconnect to what's important in life. We love the sunsets, beachwalks, and the great restaurants/bistros Lake Michigan hotels offer. We have yet to visit a Michigan resort that didn't give us all the pampering and ammenities we desired. The Lake Michigan coast is a great setting for a truly romantic wedding. Many hotels have special staff to help you plan and organize these special events. Honeymoon spot ... I don't believe there is anywhere in the world that can offer more. Every season has plenty to enjoy with our favorite time of the year being fall. Driving along the lake when the leaves are turning color really has to be experienced to be appreciated. A fine Lake Michigan beach resort will offer everything you desire to "kick back" and reconnect to what's important in life. Below are some of the top Lake Michigan hotels for your viewing pleasure, including our memorable honeymoon spot - the Boulevard Inn. Don't forget - always ask about their special romantic or wedding package deals, and various other discounts. Share Your favorite Michigan beach resort review with us. 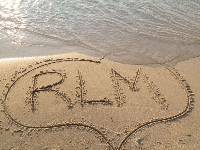 When visiting the resorts or hotels below, please mention you heard about them at romantic-lake-michigan.com. 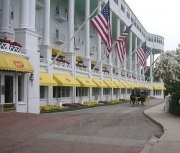 The Grand Hotel on Mackinac Island is the worlds largest summer hotel. It offers 385 magnificient rooms with breakfast and dinner included in the price. Pure 5 star luxury... that everyone should experience at least once. Go to the scenic Grand Hotel website. The Inn at Bay Harbor is one of northern Michigans finest. 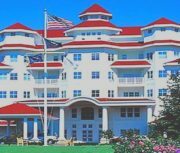 This waterfront, Little Traverse Bay resort offers world class suites up to 3,000 sq. feet, with spectacular lake views. It is one of the ultimate romantic lake michigan experience's. Be prepared for luxurious VIP pampering! Visit this beautiful Michigan beach resort. Click here and review our stay at this beautiful inn. High on a bluff overlooking lake Michigan in St. Joseph, you will find the Boulevard Inn. We spent our honeymoon here, enjoying a comfortable suite with a great lake view. They have the most charming French Bistro offering elegantly prepared dishes. A short walk to great shopping, and one of the best beaches along this southern Lake Michigan coast. Find out more about the Boulevard Inn and Bistro. The Harbor Grand in New Buffalo is best described as contemporary Arts and Crafts. Steps away from the beach, great lake views, this is a "Harbor Country" gem. When it comes to service, their staff really goes above and beyond to make your stay unforgettable. Visit the stylish Harbor Grand website. 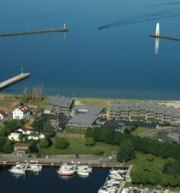 The Bayshore Resort sits on beautiful Grand Traverse bay in Traverse City. Close to all the hotspots in Traverse City, enjoy their sandy beach during the day, take in a sunset, then head to town and enjoy the nightlife. Harbor Lights Resort in Franfkfort offers you suites or condos with amazing lake views. You'll enjoy romantic sunsets from your room or deck. Visit our Northern Michigan winter page for more spectacular resorts. Lake Michigan Hotels ... perfect romantic getaways. Have A Favorite Michigan Beach Resort? Tell us what you love about it? The maximum image size accepted is 800x600.